The 25th April 2015 marks the centenary of the death of a brave young son of Cavan, just one of many who gave their lives for their king and country during the Great War. Captain Frank King Leslie, aged 29, fell on the very first evening of the Gallipoli Campaign, in a hitherto unimportant corner of the Middle East, far from the familiar fields of his native county. Leslie is one of the first Irishmen to die in this theatre of conflict, serving as he was with the Royal Fusiliers (London regiment), which landed at “X” Beach, Cape Helles. Though the Royal Dublin Fusiliers and Royal Munster Fusiliers, landing at nearby “V” Beach, suffered enormous casualties the same day, the bulk of Irish losses at Gallipoli came following the landing of the 10th (Irish) Division at Suvla Bay on 7th August, many months later in the campaign. Innumerable books and articles have been written on this disastrous episode in the war, which one need not dwell on here. However, no matter one’s beliefs and politics, it is still fitting to note the passing of a gallant soldier and officer, who died performing his duties to the best of his abilities. Frank King Leslie was born on 6th September 1885, the only son of Henry King Leslie and Ruth Hungerford-Eager. His father, a member of the Leslie family of Corravahan House (aka Coravahn), Drung, Co. Cavan, was a land agent, and was at that time resident at Kilnahard, Mountnugent (unpubl. diary of Charles Robert Leslie), where he may have been steward on the Bobsgrove estate. Frank’s birth was recorded in the “Dublin North” D.E.D., indicating perhaps that his mother was ‘confined’ with relatives or in a lying-in hospital in that part of the city. He was baptised in Drung Parish Church on Sunday 22nd November. His godmother was Lady Alice Elizabeth Cole (4 February 1853 – 25 August 1931), daughter of William, 3rd Earl of Enniskillen. Frank followed his father into Harrow School, Middlesex, in 1899, where he appears in the UK Census of 1901. He graduated to Sandhurst military academy in 1903, from where he entered the Royal Fusiliers (City of London Regiment) as 2nd Lieutenant on 28th January 1905, with a posting to India. His parents were at this time resident at Glenburne, Rockcorry, Co. Monaghan (Wood, J., Old Harrovian, p. 803), where Henry Leslie was agent to the estate of Lord Dartrey. Frank was promoted to Lieutenant on 30th May 1907, and Captain in March 1914, serving for much of this period with his regiment in India. 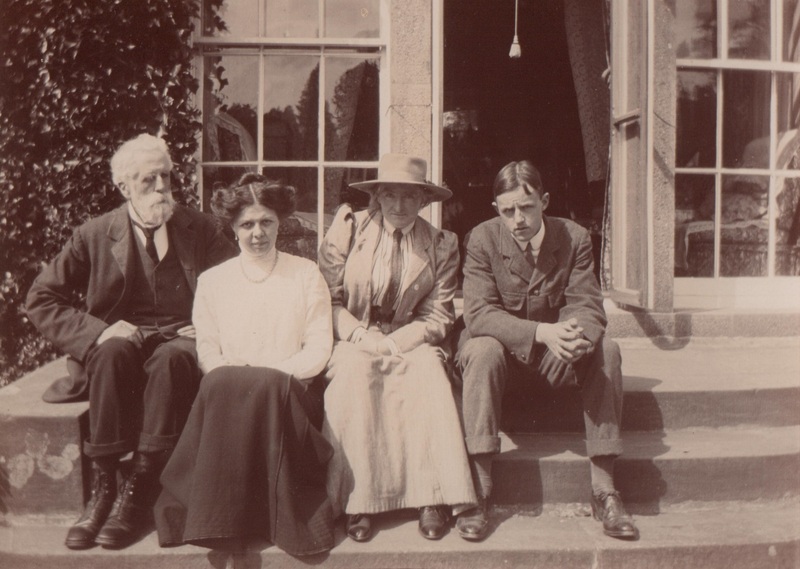 In these happier times he was photographed, with his parents and sister, Joan, at Corravahan House. In the 1911 UK Census, he is recorded as “overseas military”, and in 1912 he was stationed at Totley camp, near Sheffield, Yorkshire. 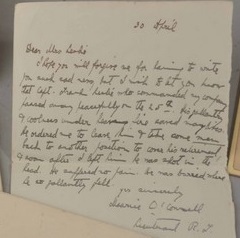 On 20th April 1915, he wrote to his younger sister, Madge, from on board the Cunard liner “SS Alaunia”, which had been requisitioned as a troop transport during the Gallipoli campaign. Sadly, Frank was dead before the letter was received at Rockcorry on 10th May. 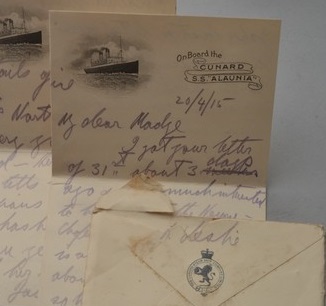 A letter home to his sister from Frank on board the troop ship “SS Alaunia”, then somewhere in the Mediterranean Sea. The Commonwealth War Graves Commission records his death (KIA) on 25th April 1915, while serving as Captain with the Royal Fusiliers “X” Company, 2nd Battalion (www.cwgc.org/find-war-dead/casualty/690321/LESLIE/FRANK KING). He was recorded as killed on “X” Beach at Cape Helles. Having landed from HMS Implacable, the company appears to have had some success in advancing to the cliffs behind the beach, and the Fusiliers secured the Turkish trenches by 9am. By 3pm, however, advancing Turkish reinforcements forced Leslie’s detachment into retreat. Some days later, a letter was sent to his mother, informing her of his tragic death. As the place is not named, it may have been many months before the family knew where he had fallen. I hope you will forgive me for having to write you such sad news, but I wish to let you know that Capt. Frank Leslie who commanded my company passed away peacefully on the 25th. His gallantry and coolness under heavy fire saved many lives. He ordered me to leave him and take some men back to another position to cover his retirement, and after I left him he was shot in the head. He suffered no pain. He was buried where he so gallantly fell. Letter received by Mrs Ruth Leslie, informing her of her son’s death. he could gather, marched towards the right to effect a junction with the Lancashires at ” W ” beach (p. 89). Z, commanded by Lieutenant Jebens (p. 91). … The battalion’s losses had been very heavy. Leslie and Lieutenant R. E. G. A. de Trafford were killed (p. 93). Co. Monaghan, and of Ruth Leslie. at the landing on X Beach, Gallipoli. Subsequently the Leslie family received the king’s memorial scroll, for those who served and died in the War. 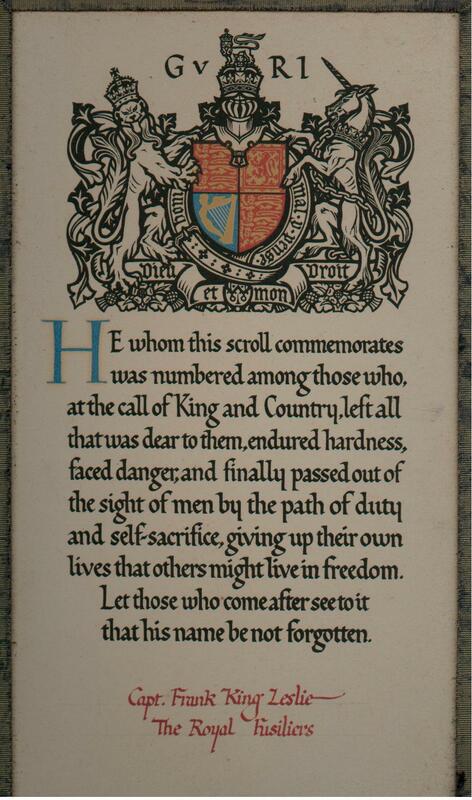 Memorial scroll to Capt. Frank King Leslie, Royal Fusiliers. 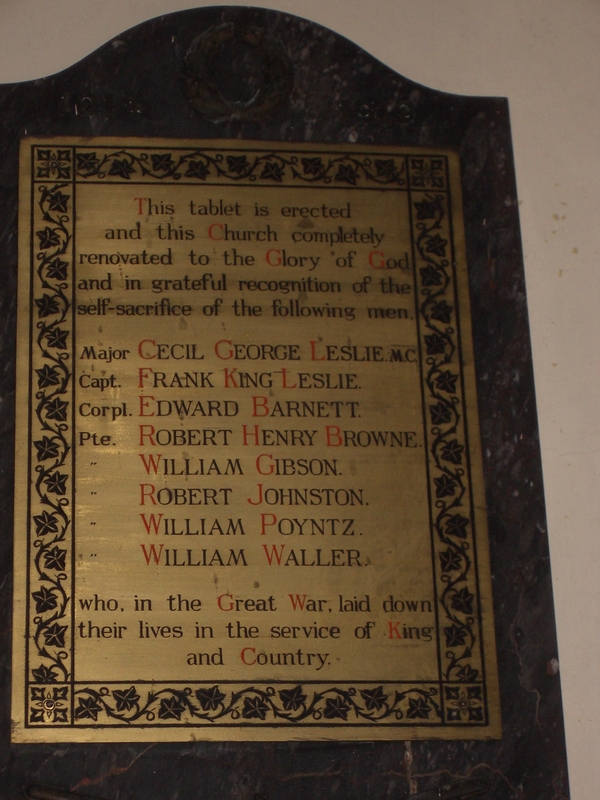 Leslie is commemorated in the small parish church at Drung, along with his cousin (Cecil George Leslie MC), and also on the Helles Memorial, near where he fell, and still lies, at Cape Helles in modern-day Turkey. The memorial at Drung Parish Church. 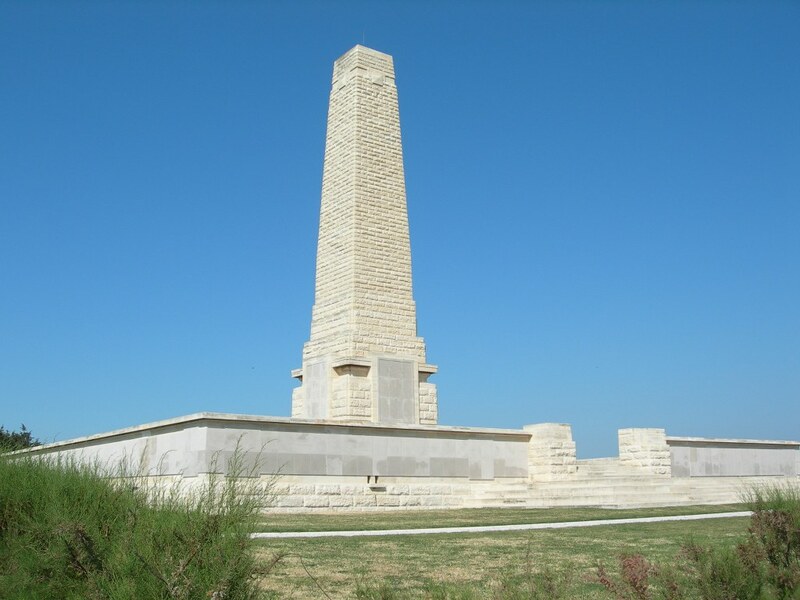 The Helles memorial, Gallipoli (CWGC). Consequent to Frank’s death, and that of his cousin Cecil in 1919, also as a result of wounds inflicted during the war, it was Madge and her sister Joan who inherited the house at Corravahan in 1930. Unmarried, the pair lived here until their deaths in 1972, sharing the house for many years with their late brother’s fiancée, May Haire-Forster. Neither Frank or Cecil are recorded in the recently published “Roll of Honour”, commemorating County Cavan’s World War One dead. 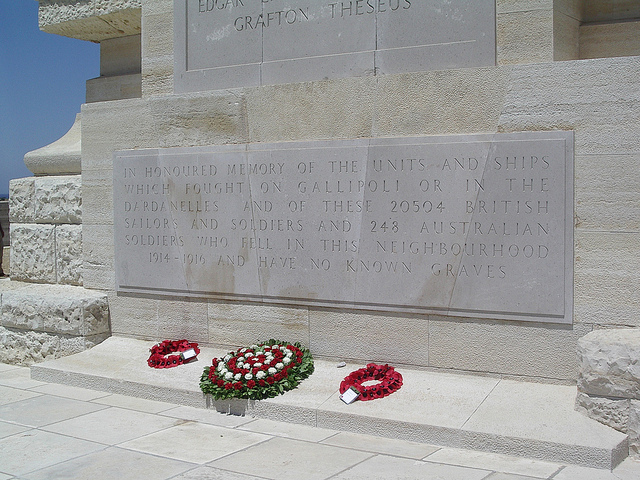 Cenotaph to those 20,000 British servicemen whose remains lie unrecovered, Cape Helles, Gallipoli (CWGC).